Editor’s note: Here’s our first Apple Watch review from Thao (@thaobnguyen), our head of research and design. Look for a companion review taken from Noel (@noelportugal) later this week. Thanks, Apple! I got an Apple Watch (38mm) delivered on Friday, April 24. The Watch packaging, quite different than the Watch Sport packaging. Full disclosure, I’m a long time Apple user. My household runs on Apple so many would say I’m an Apple-fan girl. Even so, I’m amazed by the excitement Apple generates and surprised by my own excitement over the Watch. I’ve used other smart watches for years, but why was I so eager to get my hands on an Apple Watch? Perhaps, it is was all the buzz about limited supply and high demand, and I could be among the “few” [thousands] to get the Watch first. Whatever the reason, I’m feel pretty lucky to be among the first customers that received an Apple Watch. After spending the weekend with the watch, I would say I like it, but I’m not in love with it. It hasn’t reach the status of being invaluable. For now, I view it is a pretty awesome iPhone accessory and wearable. I feel constantly in touch and reachable – I don’t think I will ever miss a text message or email again. Many apps have been updated to support Apple Watch. The Watch apps have much simpler interaction than iPhone apps, which I’m starting to explore and get used to. Those that do it well, it feels cool to be able to do it on the watch. Those that don’t (such as not providing enough information), I’m sad I need to reach for my iPhone. Lastly, Apple Watch consolidates features of my wearables into one so I am give up my other wearables for now. I wore a smart watch that was primarily a golf range finder (and I look forward to trying Apple Watch on the golf course) and a separate fitness tracker. 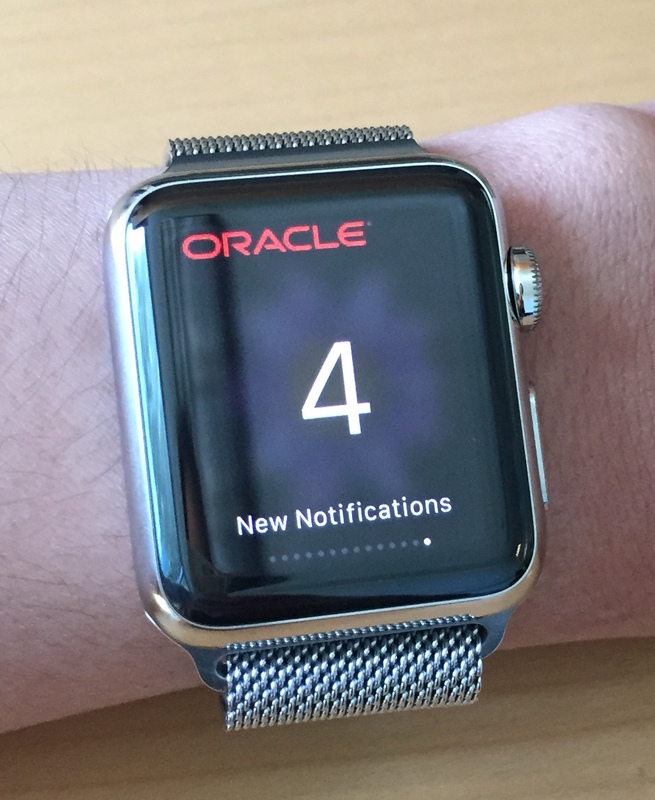 I will just be wearing the one Apple Watch now. I’m curious to see how my behavior and device usage pattern changes over time. Will I become dependent upon and attached to Apple Watch as I am with my iPhone? The watch does last all day. I start the day with 100% battery and end the day between 20-40% battery. However, my iPhone battery seems to be taking a hit. Yes I can make and take a phone call on the watch. The sound quality is good and the mic is good. Caveat, I did not attempt to have a conversation in a loud setting like a busy restaurant. No fat finger issues. The buttons and apps icons are seemingly small but I pretty much tap and select things on the watch without error. Pairing between Apple Watch and iPhone was easy, and the range is good. I could be wearing the watch in one room of my house while the iPhone was in another room and had no problems with them being in range of each other. Cool factor – surprisingly no! Only one person asked me if I was wearing an Apple Watch. Contrasted with other smart watches I have worn, where I would always be asked “what is that?” I’m guessing it is because the Apple Watch fits me and looks like a normal watch. It doesn’t draw attention as being oversized for my wrist. Please leave comments as to your own use, or tips and tricks on getting the most out of smart watches. 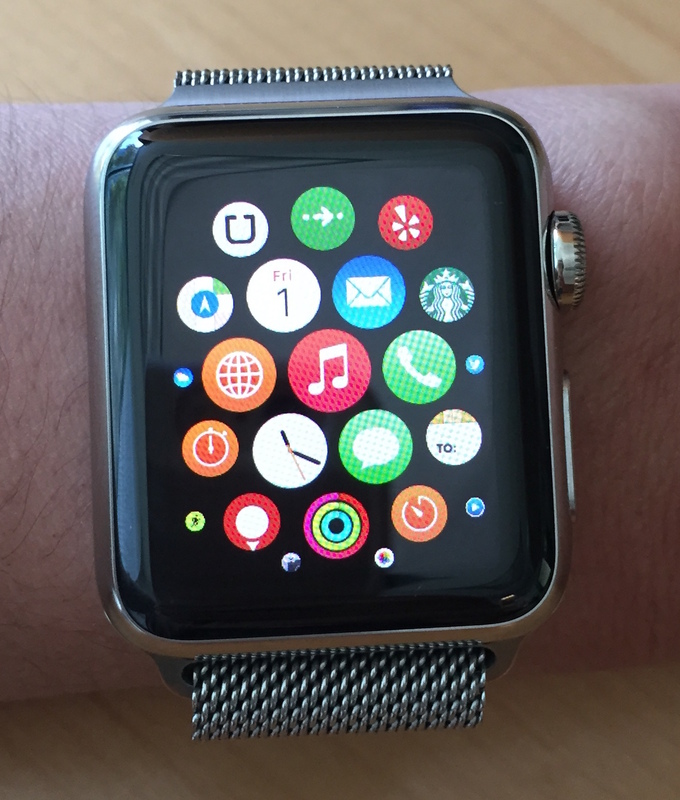 Can you blog about your paying for the coffee with ApplePay on the watch experience? Same question with Julia too. After several months of use, I continue to use Apple Pay. I now look to see if a merchant accepts Apple Pay and the list is growing. The novelty has worn off and cashiers are no longer surprised. Apple Pay has made paying easier but I think it could be even easier as IoT takes off. I find myself thinking of the Square Wallet (which no longer exist), where I went into my favorite coffee shop and the barista knows me and has Square pulled up for me to pay for my coffee. I didn’t even have to turn over my wrist.